Look for a crepes and hot cocoa sidewalk pop-up in Rittenhouse. Planning on doing your holiday shopping in Center City? Christmas Village, the Made in Philadelphia Market and the shops and boutiques by Rittenhouse Square Park are popular destinations for gift buying. 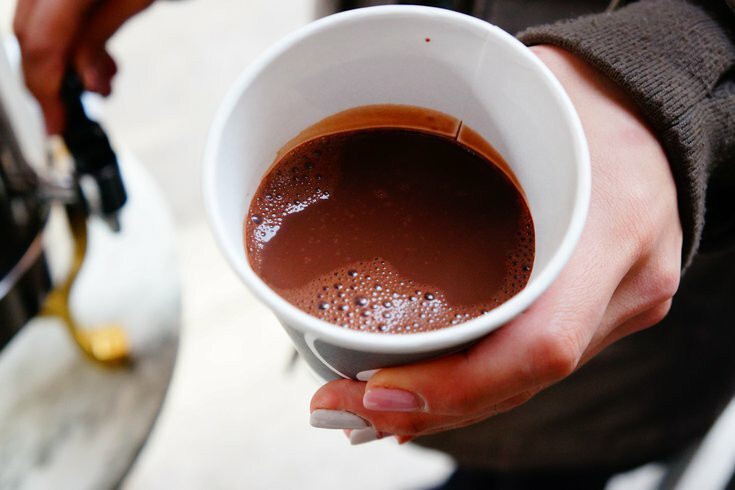 While browsing in Rittenhouse, shoppers are invited to stop by a.kitchen's pop-up sidewalk stand on 18th Street for mulled wine, hot cocoa made with Éclat Chocolate and crepes. There will be sweet options, like chocolate and fruit, and savory, like duck confit with mustard and red cabbage. The stand, back for a second year, will be open on two weekend this December. Look for it on Saturday, Dec. 15, and Sunday, Dec. 16, as well as Saturday, Dec. 22, and Sunday, Dec. 23. If you end up leaving your holiday shopping until the day before Christmas Eve, a big cup of mulled wine will definitely be needed during the last-minute chaos.